The Long Range Desert Group were masters of navigation and one of Britain’s most famous special forces. They owed much of their success to the scientific talents of their first commander, Major Ralph Bagnold, whose sun-compass invention revolutionised desert travel. Founded in July 1940 by Royal Engineers officer Major Ralph Bagnold, the Long Range Desert Group (LRDG) specialised in raids and reconnaissance behind enemy lines. Masters of desert navigation, they relied on lightly-armed jeeps and lorries to traverse the Sahara and gather intelligence. Bagnold’s men were energetic, innovative, self-reliant, physically and mentally tough, and able to live and fight in seclusion in the wilderness. Many volunteers came from Commonwealth units, as Bagnold believed these men had the required characteristics. Listen to Jimmy Patch describing his Second World War experiences as a member of the Long Range Desert Group in an interview recorded in 1994. The LRDG’s ‘Road Watch’ reports on Axis troop movements were vital to Allied successes in North Africa. Important raids included the attack on Barce airfield in Libya in September 1942 that destroyed 16 planes. 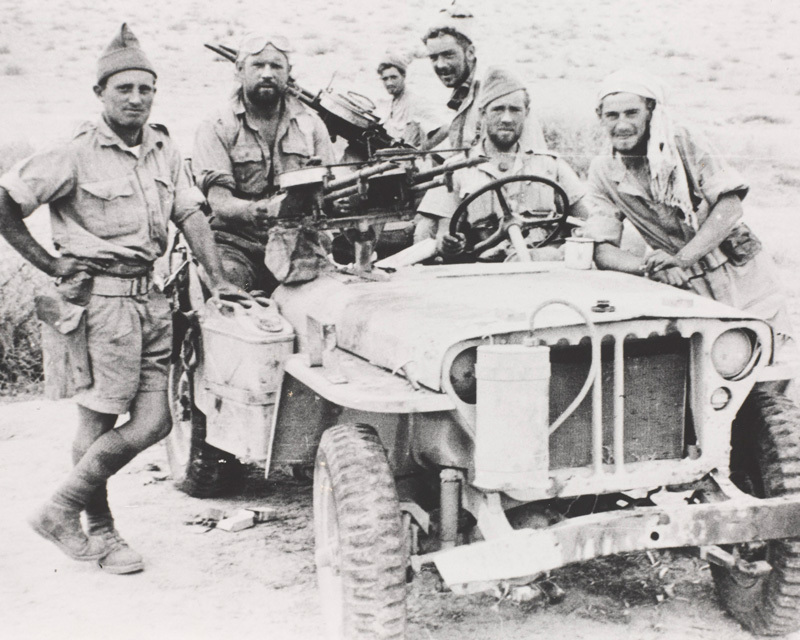 The LRDG also drove Special Air Service raiders behind enemy lines. Following victory in North Africa in 1943, LRDG personnel were transferred to the Aegean, where they undertook more raids and reported on enemy shipping movements. What animal does the badge of the Long Range Desert Group depict? The LRDG's badge was designed by one of its earliest recruits, a New Zealander called Gunner C Grimsey. He was stung three times by a scorpion while serving in the North African desert. Ralph Bagnold had pioneered successful desert exploration during the 1930s. He made the first recorded east-to-west crossing of the Libyan Desert in 1932, using Model A Fords, and had carried out scientific work on the physics of sand and the movements of sand dunes. He also invented the technique of driving with reduced tyre pressures over loose sand and at speed over sand dunes. Both methods later became standard for desert travel. Bagnold also developed a way of conserving the precious water that was lost - usually from an overflow pipe - when vehicle radiators boiled over. His innovation was to connect the overflow pipe to a can half full of water on the front of the vehicle so that the boiling water would condense in the can. When this water also began to boil over, the driver would turn his vehicle into the wind. After a short time, all the water would be sucked back into the radiator, filling it up again. In an era before satellite navigation a good compass was essential in the barren and featureless North African desert, most of which was unmapped. 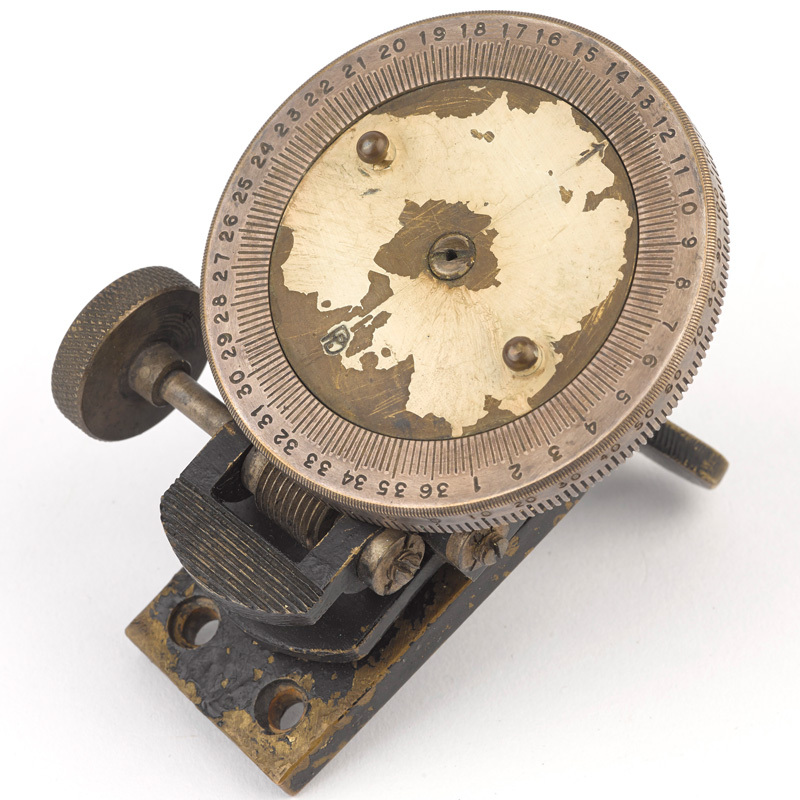 During his early travels, Bagnold had used a magnetic aero-compass, lent to him by the Royal Geographical Society. The compass was mounted on his vehicle, but he could not compensate it properly due to the magnetic influence of the car’s metal. Bagnold was often forced to stop his car and take bearings away from the vehicle. 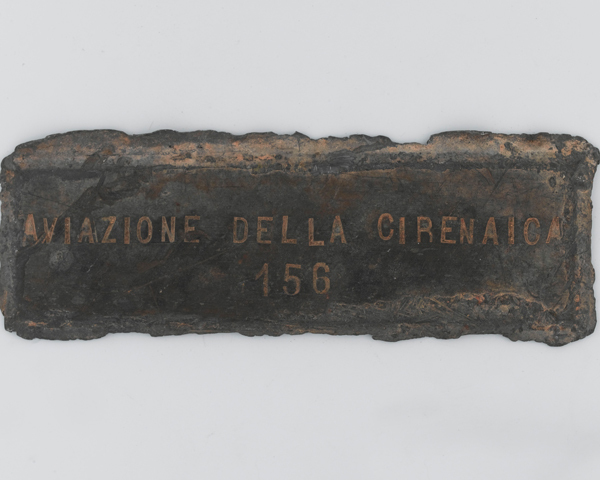 He also found that the iron ore deposits sometimes found in desert regions affected this instrument. 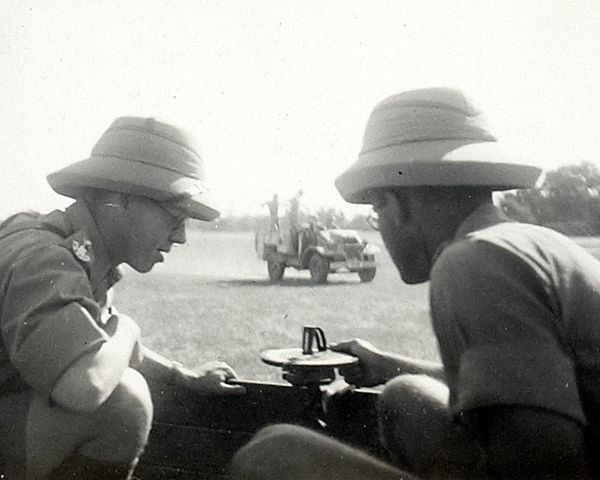 The LRDG also experimented with different sun-compasses. These were unaffected by magnetism, but had to be reset in line with the sun whenever they changed course to traverse rough terrain or avoid enemy troops. This again delayed the progress of their convoys. Bagnold therefore invented a new sun-compass that could be used while still driving. This worked by turning its disc to match the approximate azimuth of the sun (taken from tables of different dates and latitudes) at regular times. 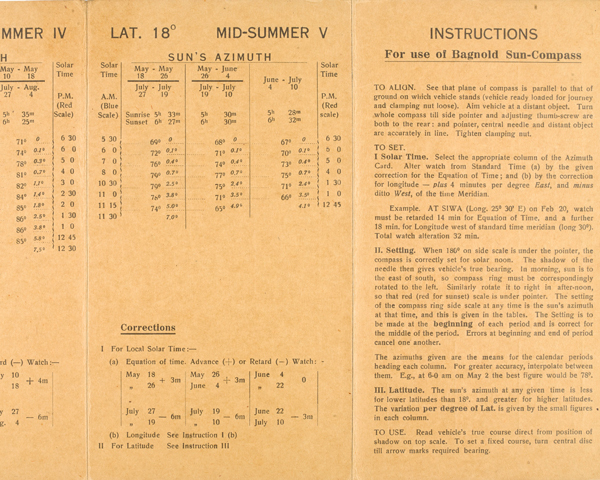 Bagnold had his compass fitted to the dashboards of the LRDG's vehicles. 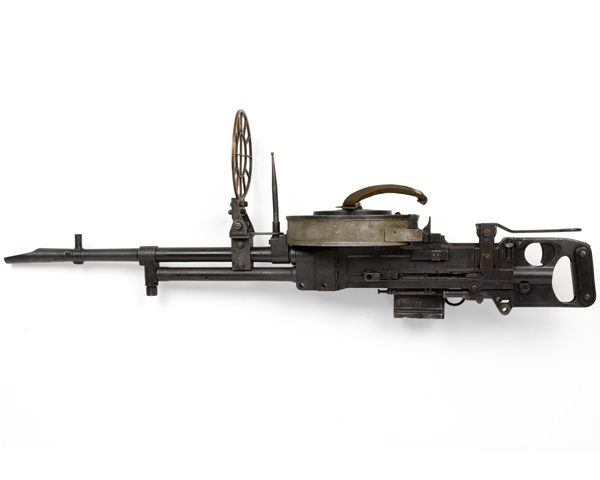 The one shown above was used by members of the LRDG’s Indian Squadron. Its navigators could now continuously log bearing and mileage regardless of any changes in course. This record permitted a reliable plot to be made of their preceding route at every halt. ‘The compass we used was invented by Bagnold, and the advantage that it gave us over the sun-compasses used by the rest of the Army lay in the fact that it showed the true bearing of the course followed at any moment, whereas the other types only made certain that if the sun’s shadow fell on the correct time-graduation the truck was following a set course.